An attempted drive-by shooting this time last year didn’t work out so well for the shooters when the intended target shot back. Police reported that three men in a maroon Nissan sedan were driving near Mercedes Lane in Houston around 2:15 a.m. and likely intended to at a house. According to officers, as the Nissan drove past the house the men inside started shooting. However, the homeowner who was standing in his yard fired back at the car hitting all three men inside the vehicle. 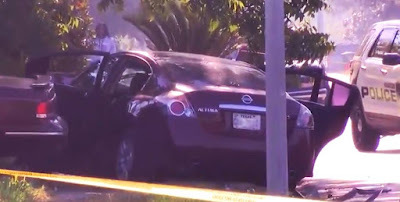 The Nissan’s driver then crashed into another vehicle whereupon the men got out of the Nissan and continued to exchange gunfire with the homeowner. The homeowner was a better shot (surprise!) and hit all three of his assailants. Police said one man died at the scene and although an ambulance transported another individual to a near-by hospital he was dead on arrival. An ambulance took the third assailant to a hospital where he was treated for his injuries. The homeowner who was standing in his yard was uninjured. Police took him in for questioning; however, police released him and he has not been charged. Investigating officers said it appeared to be self-defense. Standing in his yard at 2:15 a.m. Hmmm. . .
How many of you plan to be standing in your yard tomorrow morning at 2:15 a.m.? Perhaps the homeowner always stands in his yard at 2:15 a.m. Perhaps he knew some former friends or colleagues were planning to come for a quick visit and he was there to greet them. It turns out that the homeowner coincidentally standing in his yard also had a semi-automatic Modern Sporting Rifle or MSR—also commonly known as an AR-15. Police reported that the participants fired over forty rounds during the gunfight; however, they did not assign credit for who fired what or how much. Still the homeowner’s performance in this gunfight under low light conditions is impressive. I’ve been teaching low light classes for a number of years and students often have a very difficult time when they first experience low light conditions. Based upon what I can see in the video, the car crashed approximately 50 yards from the homeowner who had taken cover behind a substantial tree (bullet strikes visible on the tree). If his AR was equipped with a flashlight and if the assailants were armed with pistols, they likely had no chance in the gunfight. Seems like a breakdown in the victim selection process on the part of the bad guys.